A delicious sausage stuffing with dried cranberries. Perfect for holiday dinners or as a casserole by itself. In large skillet, crumble and cook sausage until browned. Remove from pan. In same skillet melt butter over medium heat. Saute celery and onions until softened, about 5 minutes. 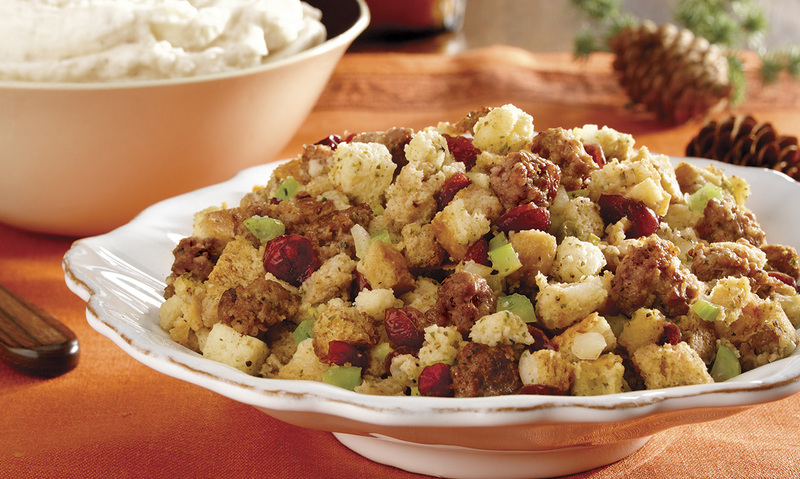 In a large bowl, combine celery, onions, sausage, stuffing mix, cranberries and salt. Add the broth and stir until well combined. If desired, loosely stuff some of the mixture into a turkey just before roasting. Place the rest of stuffing mix into a casserole dish. Cover and bake in a 325F. oven for 1 hour or until hot. *Can use either Bob Evans Original Roll Sausage or Bob Evans Savory Sage Roll Sausage. 1 Preheat oven to 325F. 2 In large skillet, crumble and cook sausage until browned. Remove from pan. 3 In same skillet melt butter over medium heat. Saute celery and onions until softened, about 5 minutes. 4 In a large bowl, combine celery, onions, sausage, stuffing mix, cranberries and salt. Add the broth and stir until well combined. If desired, loosely stuff some of the mixture into a turkey just before roasting. 5 Place the rest of stuffing mix into a casserole dish. Cover and bake in a 325F. oven for 1 hour or until hot. *Can use either Bob Evans Original Roll Sausage or Bob Evans Savory Sage Roll Sausage.